40 Plus automobiles from a 1903 Oldsmobile Horseless Carriage to a 2008 Shelby GT500KR Mustang. 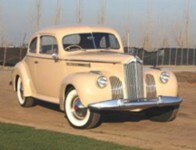 A large number of Packards from 1934 to 56. The longest model railroad train layout in Ventura County.